Specialty Group Pty Ltd is proud to announce that its Specialty Theatre division has provided stage curtains and a new cinema screen as part of the theatre refurbishment of the historic Rex Theatre in Charlton, Victoria. The iconic Rex Theatre in Charlton, central Victoria was built in 1938 in the Art Deco style. The Rex Theatre has operated almost continuously since then, providing an important community asset for generations of locals and visitors. Most recently The Rex has been run by a community group called the Charlton Community Theatre Board (CCT). The CCT has mostly been funded by generous locals and much of the work in the theatre has been provided by volunteers. 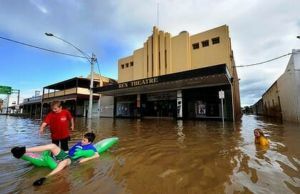 Tragedy hit Charlton in January, 2011 when the Avoca River, on whose banks the town of 1500 is situated, broke its banks and inundated the town. In all, 337 homes were flooded, comprising approximately 80% of the town. Unfortunately the flooded buildings included the Rex. The dedicated volunteers for this theatre refurbishment were not daunted. Despite many of them suffering flooding at their own homes, they banded together to re-open the Rex. Fund raising swung into gear and before long tradespeople and volunteers were working together to restore the historic Rex. Specialty Theatre was proud to be contacted by the CCT and worked hard to provide a new plush velvet festoon front-of-house curtain. This curtain fits beautifully with the Art Deco style of the Rex and complements the many fixtures in the building. In addition, Specialty Theatre provided new black wool theatre fabric border curtains, new wool leg curtains and new plush velvet curtains for the auditorium entry. These were complete with a decorative gold trim. Working together with Edge Digital Technology Pty Ltd, Specialty Theatre installed a new cinema screen and installed surround and rear wall speakers. These features mean that the Rex can be used as both a state of the art cinema, but also as a live performance space for local groups as well as visiting artists.